You all know the old saying about March – “In like a lion, out like a seven pound, 15 ounce bouncing baby boy.” Well, I don’t know if that adage has ever been more true than it was this year, as the Rempe family welcomed Matthew Ronald Rempe to the team early in the morning on March 28. As one might expect from a Rempe, Matthew’s arrival was not exactly conventional. Yes, all those points are disturbing, but there is something else—something vague and undefined—that always seemed to scrape uncomfortably against my subconscious. Then, as I began reciting the story for the umpteenth time, it dawned on me what it was that was so irritating. When the bears leave the house that ill-fated morning, they do so after having prepared three bowls of porridge—a large bowl for the similarly-proportioned Papa Bear, a middle-sized bowl for the Mama Bear, and wee little bowl for the offspring of these two. 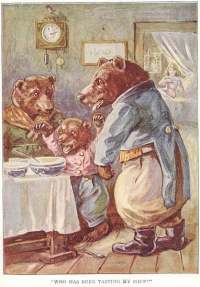 When Goldilocks happens upon the Bears’ cottage, she notes that the large bowl of porridge is “tooooo hot.” She then comments that the middle sized bowl is “tooooo cold.” Finally, she finds Baby Bear’s bowl to be to her liking, and consumes it. Obviously, this flies in the face of all we know from modern science about temperature transferal. If one assumes that the porridge was served from a common source (and seriously, what Mama Bear would make an entirely separate pot of porridge for each family member? ), then we can say that at the time of egress, each bowl of porridge was at roughly the same temperature. Now, the story’s protagonist arrives. The largest bowl, we are told, remains too hot to eat. Based on this information, one could surmise that the next bowl in descending size would be somewhat cooler than the larger bowl, with the smallest bowl being the coolest of the three. But no. Somehow, the middle bowl is now the coolest of the three, with the smallest one being the optimal, median temperature. This simply cannot be.